Hi everyone! It’s finally time to peel back the curtain on ‘The Secret Project’ that my coworker, who is none other than the awesome Bryce O’Connor, and I have been working super hard on for the last few months! 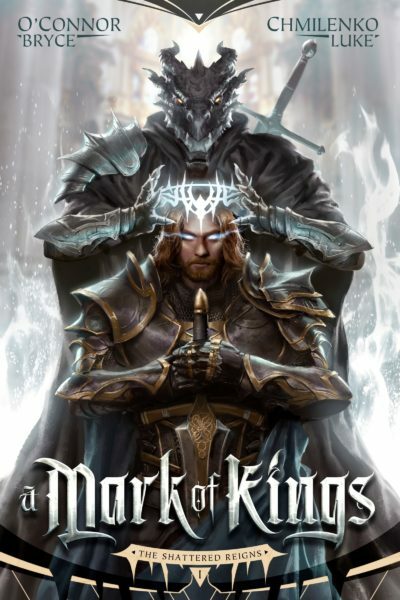 I am happy to announce that on May 1st, we will be releasing a new Epic Fantasy series titled ‘A Mark of Kings’. In addition, I am also super excited to announce that the audiobook will be narrated by the awesome Nick Podehl! (Release date still TBD). Until then, here is a small teaser about what to expect! Despite his youth, Declan Idrys knows of the evils of the world. He knows of the bastards and brigands who plague the King’s lands, of the monsters skulking in the wooded depths of the realm. Together with his companion, Ryn – a horse of rather peculiar talent – he has spent the last decade of his life beneath the bloody banners of a half-dozen mercenary guilds, hunting precisely such wickedness festering within the borders of Viridian. Unfortunately, fate is quick to pull on the leash of its favorite children. When one particularly troubling contract goes sideways, Declan and Ryn find themselves thrust into a war thought legend and long-ended, a conflict so old it is synonymous with a time in which dragons still ruled the western skies. Now, as dead men rise from their graves and the terrible beasts of the northern ranges descend into the kingdom with an appetite for savagery and flesh, Declan is faced with a profane choice. He can turn, can flee an ancient rising horror that would see the realms of man left as shattered death and wind-blown ash. Or, Declan can face this mounting threat, can come to terms with the fact that his oldest friend might just be more than he appears, and learn to wield an ageless power all his own. If you’re interested in staying right on top of this until release, feel free to shelve it on Goodreads!